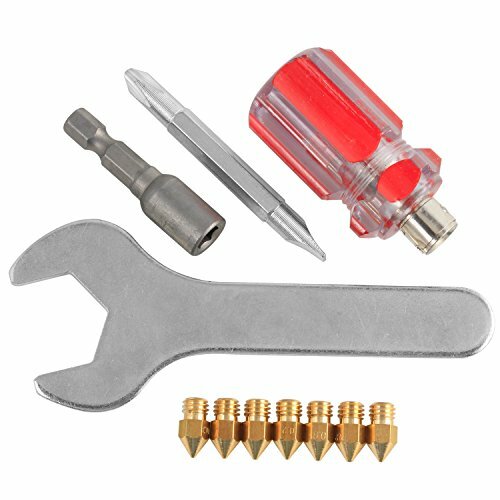 3D Printer Nozzles + 4 DIY Tools for MK8 3D Printer 0.2mm 0.3mm 0.4mm 0.5mm 0.6mm 0.8mm Nozzle Tool for Nozzle replacement, Spanner, Installation tools … by Biaobiao at 3D Printing Supplies Outlet. MPN: BB-IN-S01. Hurry! Limited time offer. Offer valid only while supplies last. No more burnt fingers for me! This is a must have tool for changing print nozzles. Having the right tools makes all the difference in the world! Compliant with who has MK8 heat block 3D printer: The nozzles used M6 thread, heat block thread hole is 6mm, same as MK8 MK7 UM2 CR10 etc. Special tools:Upgrade special wrench and multi-function screwdriver can help you adjustment 3D Printer and change extruder nozzle more easy! If you have any questions about this product by Biaobiao, contact us by completing and submitting the form below. If you are looking for a specif part number, please include it with your message.